How Much Does Wood Floor Installation Cost? Many people opt to hire a professional contractor when they need wood floor installation. This project involves many complicated tasks that demand considerable amounts of time and expertise. They might also require various equipment that the average homeowner doesn't necessarily own. Wood flooring is certainly not the least expensive option, but it provides an attractive and long-lasting solution. When homeowners replace floors with this top-notch material, they can eliminate annoying "creaking" sounds from old flooring and also effectively banish scratches, stains and burn marks on existing floors. The size of the floor and the specific species of wood will make a big difference in your overall cost. Maple, ash, hickory, cherry and oak all sell at different prices ranges. You can expect to pay less for maple and more for cherry. Engineered wood also costs less than solid hardwood. Engineered products are partially filled with plywood, so homeowners spend less on high-end lumber. This also makes it more moisture-resistant. cleaning the subfloor as well. A consequential factor is the difficulty removing the previous flooring material. For example, tile floors will increase the overall labor cost of a wood floor installation because they're comparatively hard to remove. 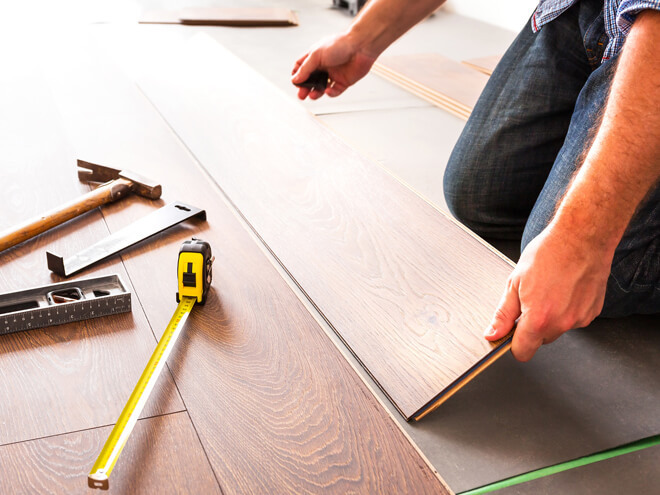 Due to the complexity of a wood floor installation, homeowners are well advised to contact professionals in their area in order to compare quotes for this specialized project. Comparing estimates will help you establish the pricing trends for your specific region. Consider the following wood floor types and each of their per sq ft cost to install wood flooring. Keep in mind that, for this cost guide, we have based our averages on a 300 sq ft room. The traditional wood floor can be split into two types, soft woods such as pine, cedar, fir, and hardwood like oak, maple, and ash wood. Before installation, you can expect soft woods to go for between $3 - $6 per sq ft and hardwood between $5 - $10 per sq ft.
A professional installation of these will add $3 - $10 a sq ft. This would make the overall cost to install a soft wood floor between $1,800 - $4,800, and for hardwood, between $2,400 - $6,000. This type of wood flooring is slightly cheaper and features a thin layer of real wood glued over a cheaper wood product. An entry level engineered wood floor for a 20ft x 15ft ( 300sq ft ) room will cost between $6 - $10 per sq ft ($1,800 - $3,000) to install. Middle-grade quality will cost between $8 - $15 per sq ft to install, totaling anywhere between $2,400 and $4,500. High end engineered wood floors will fetch between $13 - $18 per sq ft installed ($3,900 - $5,400). There may also be a minimum labor charge of $200 - $500 for smaller project. The cost of bamboo flooring materials and installation begins at around $4 - $10 per sq ft for engineered bamboo panels and unfinished planks. A 300 sq ft room will cost anywhere between $1,200 - $3,000. Mid-range you can spend around $7 - $13 per sq ft ($2,100 - $3,900), and on the high end a premium installation will set you back $10 - $18 per sq ft ($3,000 - $5,400). Created from the bark of the cork oak tree, installation and materials will set u back between $5 - $12 per sq ft ($1,500 - $3,600). Any special color or style will push this up to $12 - $20 per sq ft (3,600 - $6,000). There are several additional factors to consider when trying to calculate your overall budget to install a wood floor. Prep - An older floor often needs preparation before a new wood floor installation can begin. Professionals will always check the existing subfloor for damages. If this needs replacement, you can expect to pay around $25 per sheet of plywood, which is usually 4ft x 8ft. On a 300 sq ft room, without any obstructions, you would require roughly 10 of these sheets, costing around $250. Molding, foam underlay & vapor barriers - Removal of molding and placement of foam underlay or vapor barriers costs around $9 per sq ft. In a 300 sq ft room, this would equate to a total of $2,700. Supplies - Professional installers charge customers for various supplies, such as moisture barriers and sealants. Enough sealant for 300 square feet will boost the price by about $36 ( $0.12 a sq ft ). Adhesives - Adhesive typically costs $20 or more per gallon. Flooring contractors bill tool purchases and maintenance into their labor charges. They need things like staple guns, safety gear, and levels. Your home's geographic location also plays a significant role in determining the exact cost to install your wood floor. Contractors might charge less if they face a considerable amount of competition in the local area. Your state's tool, material and fuel prices can also affect their rates. For example, installers will probably charge more to travel a long distance in California than they do in Maine. Such differences have the potential to undermine the accuracy of the above-mentioned national estimates. If you would like to get a more accurate idea of pricing trends in your region, get in touch with local contractors and compare several quotes. This will help you establish what you will be paying in your specific region. How Much Will It Cost To Install a Wood Floor? The cost to install a wood floor usually starts at around $1,300. A homeowner might only pay this much for ash flooring in a comparatively small house. The bill may also be this low if a customer performs most of the preparatory work before a contractor arrives. On average, however, American homeowners spend in the region of about $4,400 on the cost to install their wood floor. Remember that a higher property value could compensate for part of the expense. Alternately, people sometimes pay floor replacement bills that could be in the region of about $10,000.This would probably cover the removal of tiles and installation of a high-end hardwood like cherry. Fortunately, you can request a 100% FREE, localized estimate for your wood floor installation project from a contractor in your region. This FREE offer comes to you with zero obligations to make any purchases, and there are absolutely no hidden costs whatsoever. Simply enter your home zip now, and a knowledgeable professional will reach out to you for a more accurate breakdown of the overall cost to install your wood floor. Please keep in mind that cost averages will vary depending on your region and the specific design choices you make. Get in touch with local professionals for a FREE estimate on the cost to install your wood floor.